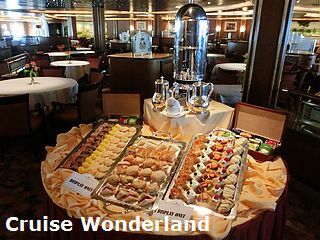 The afternoon tea of Princess Cruises is an elegant affair. On Golden Princess it is offered in Donatello Dining Room at Deck 6 midships every day (except on embarkation day) from 15:30 to 16:30 complimentarily. 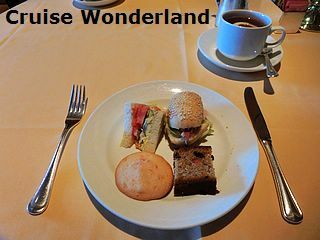 White-gloved waiters serve a variety of teas, finger sandwiches, scones with jam and cream, cookies, pastries and cakes. Live, soft music on guitars or harps is played by musicians to provide a pleasant environment for passengers to socialize.